The elegant, seductive flavor of traditional Brie has been delectably recreated as Eiffel Tower Brie Spread. The Borgo family, who brought their cheese-making expertise from Northern Italy to Ontario Canada in the 1950s, has been crafting exceptional and inspired cheeses for four generations. 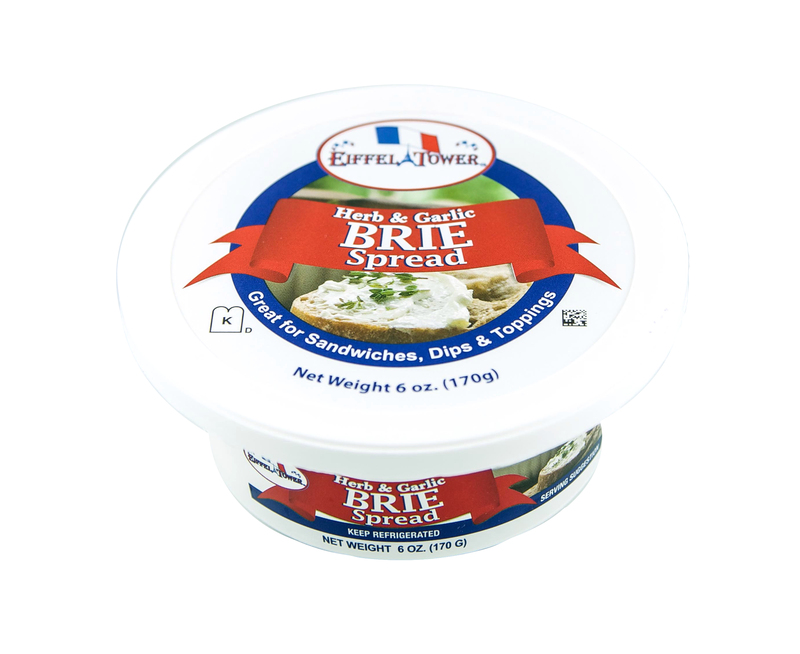 Eiffel Tower Brie Spread, their newest innovation, has all the smooth, buttery, double-cream richness of the highest quality Canadian Brie, with all the benefit and ease of a re-sealable container. Semi-soft with a luscious velvety texture, Eiffel Tower Brie Spread is made with the finest Ontario cow’s milk and comes in two delicious varieties: Plain and Herb & Garlic. Application: Perfect for generously smoothing on crackers, baguettes or other crusty breads; top with a fruit preserve, like pear of fig, for a sweet touch or spread directly on fresh apple and pear slices. For ultra-elegance, add a dollop of truffle pate. Eiffel Tower Brie Spread is also divine as a vegetable dip and adds depth to sandwiches, especially balanced with prosciutto, salami or other spicy cured meats. Also delightful served with marinated olives and artichokes. Pairings: Serve alongside a nice sparkling wine, like Champagne. If choosing a red wine, a Bordeaux well. For Generations, the name VEA has stood for the very highest standards of quality in the cultivation of olives and the pressing of fine extra-virgin olive oils. Now under their L'Estornell brand is a selection of fine olives. These Manzanilla olives from Andalusia are carefully selected from the tree and placed in water and salt for a minimum of three months. Finally, they are rinsed and bottled with fresh water, salt and aromatic wild herbs.